This graphic is doing the circuit on Facebook. 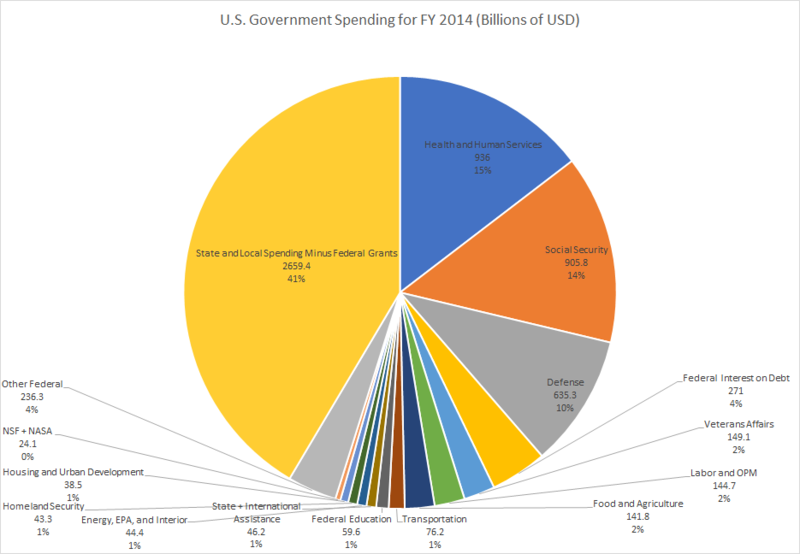 Is the pie chart an accurate depiction of US government spending? Look closely at this chart of federal spending. Somewhere within the tiny orange sliver at the bottom is the food stamp program that Republicans blame for our budget deficit. And so ends today's lesson in Republican logic. The graphic is the FY2014 requested discretionary spending, which is only a small part of the total budget as explained in the article President Obama Proposes 2014 Budget. This article specifically contains and explains the exact pie chart in the OP. 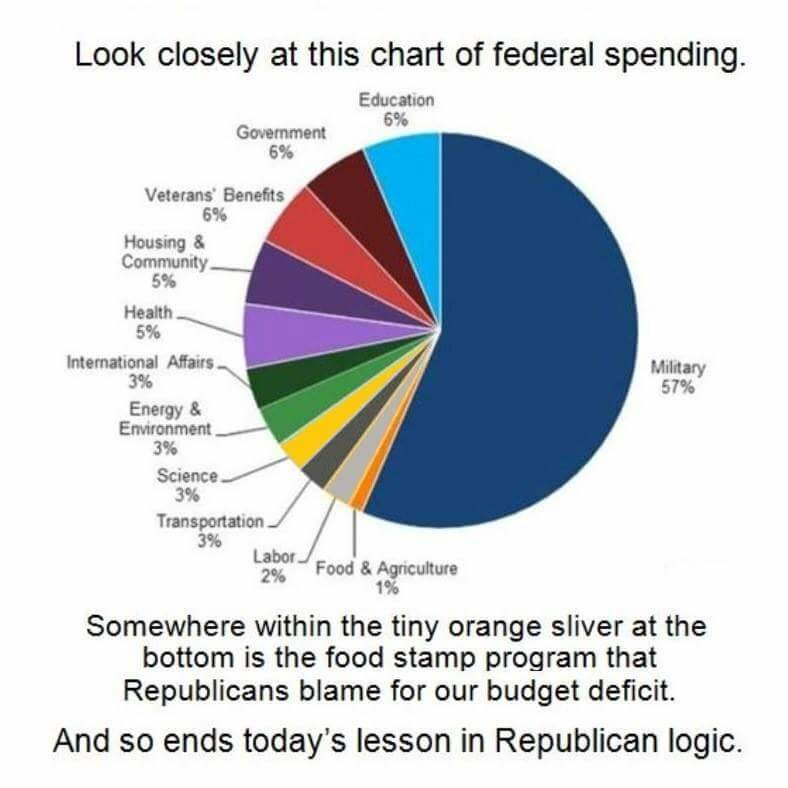 Contrary to the text below the pie chart, the food stamp program is not part of discretionary spending, it is part of mandatory spending, so it is not on the pie chart at all. Other mandatory spending programs include Temporary Assistance for Needy Families (TANF), Supplemental Security Income (SSI), unemployment insurance, some veterans’ benefits, federal employee retirement and disability, and Supplemental Nutrition Assistance Program (SNAP). Supplemental Nutrition Assistance Program (SNAP) is the current name for the food stamp program. So the SNAP program was 2.1% of total spending. The image in the question was also reviewed by Politifact and, due to its presentation of discretionary spending as if it were the total of federal spending, was rated false. Additionally, the question asks about "U.S. government spending." When discussing government spending in the U.S., it's important to remember that federal spending is itself only a piece of the pie. The chart above and the chart in the question show only federal spending. Nearly all military spending is federal, however, state and local governments account for a large percentage of government spending in the U.S. in other sectors. Education, for example, is typically funded primarily by state and local governments. The same is true for road construction and maintenance. 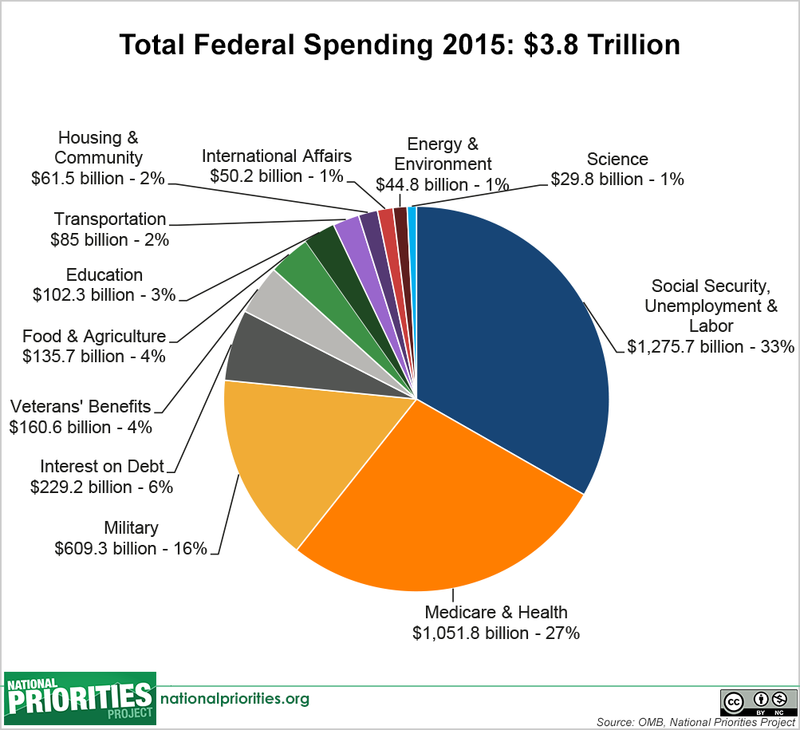 The chart above shows the $3.7 trillion dollars of federal expenditures in fiscal year 2015. However, total federal + state + local government spending in the U.S. for that fiscal year is estimated to be about $6.4 trillion, according to usgovernmentspending.com. Official data from the government for these figures is not yet available, but they're in line with what would be expected based on prior year data, which is available from the U.S. Census Bureau. When all U.S. government spending is included (state + federal + local,) education and transportation will be much larger shares of spending than when only federal spending is considered. Conversely, the share of military spending will only be about 60% of its share of federal expenditures, since nearly all military spending is from the federal government. 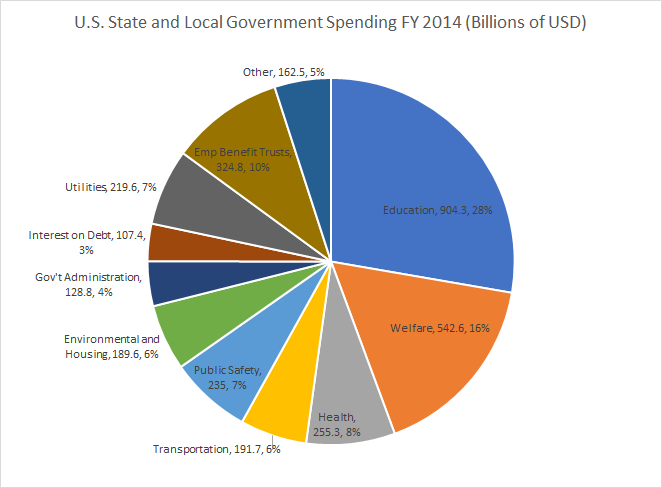 The "State and Local Spending Minus Federal Grants" portion of the pie chart shows all spending from state and local governments minus the $602 billion of that which was funded by grants from the federal government. This subtraction is necessary in order to construct an accurate pie chart, since that $602 billion would otherwise be counted twice. The "military" share, including spending on homeland security, shrinks from 57 percent to 16 percent. The "health" share zooms from 5 percent to 26 percent, once expenditures on Medicare and Medicaid are counted. Social Security -- a category not even included in the pie chart now circulating on social media feeds -- rises from 0 percent to 25 percent. Food and agriculture quadruples from 1 percent to 4 percent due to the inclusion of food stamps, a mandatory program, and agricultural income and price supports. Calculating it this way severely undercuts the graphic’s message. Rather than the federal budget being dominated by the military, the budget is actually dominated by spending on Social Security, Medicare and Medicaid. In fact. the ratio of military spending to food and agriculture spending in the full budget is 4-to-1, rather than 57-to-1. Not the answer you're looking for? Browse other questions tagged united-states government finance . Does government spending on healthcare promote economic growth? Are US government agencies' ammo acquisitions unjustifiably large? Was Ankit Fadia appointed as ambassador of Digital India campaign by Indian government?